Dated: 14/11/2018 Style guru Trinny Woodall, whose beauty brand TRINNY LONDON has announced Fenwick as its first permanent retail partner, with the Newcastle store holding an exclusive launch event today. On 12th November beauty brand Trinny London founded by ‘what not to wear’ and all-round fashionista Trinny Woodall launched in the beauty hall of Newcastle’s Fenwick store. The launch will be shortly followed by concessions in both the Brent Cross and Bond Street locations. Expected later on this November. Style guru Trinny Woodall, whose beauty brand TRINNY LONDON has announced Fenwick as its first permanent retail partner, with the Newcastle store holding an exclusive launch event today. 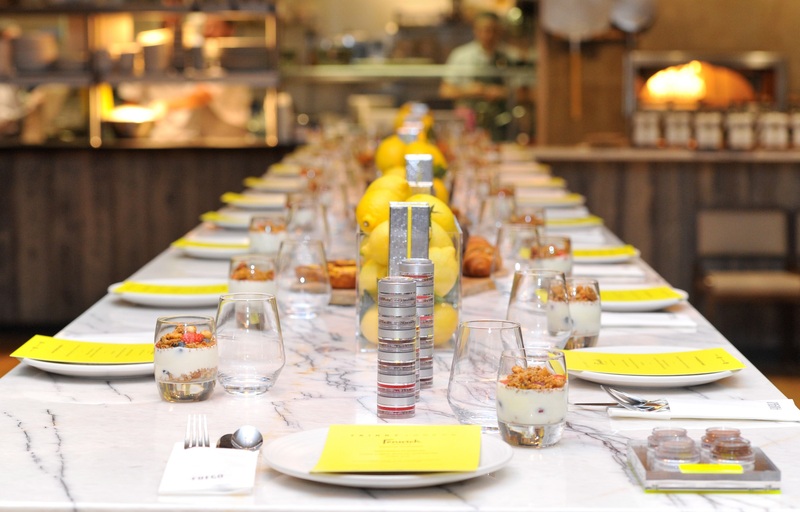 We joined Trinny herself for an exclusive brunch in Fuego Fenwick. Before heading to get our hands on the products. With Trinny commenting ‘as an online brand we [Trinny London] are excited to be partnering with offline retailer Fenwick’. Trinny London is a concept beauty brand which provides women with portable, stackable and hassle-free makeup on the go. The range has been formulated to be entirely cream-based. Using the highest quality ingredients. The pigmentation payoff is exceptional. Different looks come down to how heavy or light handed you are. As to how intense or subtle your look is. You can instantly go from day to evening wear in the back of the cab. Perfect for if you’re going from the office to evening cocktails. The colours are both buildable and bendable and have remarkable staying power. They have, of course, been designed with fingertip application at the forefront. However, they can also be applied with a brush for a totally different look. Each pot in the range can be stackable. Snapping together for on the go ease. Just stack as many as you require for throughout the day. Then throw into your handbag. Trinny, evidently passionate about the entire collection (and rightly so) has been ‘making over’ guests in her taxi around London. To promote the range over the last couple of weeks. With a hand in designing everything from the colour range to the packaging it really does ooze sophistication and style with a twist of practicality. The brand, 3 years in the making launched last year. And is already making waves in the beauty industry with this revolutionary concept. Trinny London stands offer a complimentary Match2Me consultation. This allows each individual to discover the colours that suit their skin, eye and hair combination. A simple and quick profiling allows Trinny London MUAs to determine the shades and tones perfect to you. This software has been created by rigorously testing over 600 females. Profiling their hair, eye and skin colours to break down which colour suits which combination. This Match2Me profiling is an impressive step forward in ensuring that unsuitable tones are eradicated. Therefore leaving Trinny London makeup wearers armed with the correct colours to best suit their skin. So gone are the days where a bold red lip clashes with a striking purple smokey eye! With the collection having landed in time for Christmas. Fenwick together with Trinny London has exclusively launched the new Eye2Eye RocketMan palette in store. This means that our beauty army of Newcastle are some of the first in the country to get their hands on the new palette. The makeup quality is exceptional. The staff are seriously passionate and knowledgeable. And if you’re lucky you too can catch the absolute Queen that is Ms Trinny Woodall on stand in Fenwick Newcastle. She may even give you a quick makeover, who knows. The concession is now open in Fenwick Beauty Hall. It is situated opposite Dior darlings and it’s fabulous!